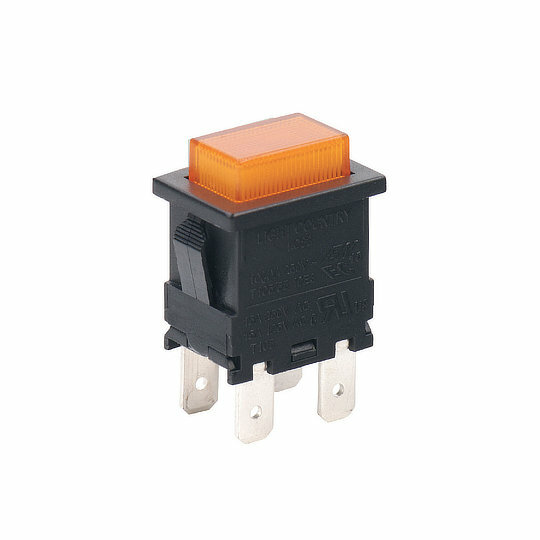 The LC83 series of illuminated pushbuttons from Dailywell are single or double pole switches with single throw operations and latching on – off or momentary (on) – off action. Electrically rated to 15A at 250VAC and a mechanical life of over 30,000 cycles. The LC83 series have rectangular housing and are designed with tab style terminals and snap-in connectors for quick mounting. The LC83 series of illuminated pushbuttons from Dailywell are single or double pole switches with single throw operations and latching on – off or momentary (on) – off action. Electrically rated to 15A at 250VAC and a mechanical life of over 30,000 cycles. The LC83 series have rectangular housing and are designed with tab style terminals and snap-in connectors for quick mounting. Available in black or white housing with a choice of 3 non-illuminated and 3 illuminated actuator colours. The LC83 series is perfect for applications needing higher current ratings such as Home Appliances, Audio-Visual Equipment, Computer Peripherals, Networking Equipment and Industrial Control Systems.